Managing Successful Programmes MSP Certification is one of the best practice solutions published by AXELOS Limited UK which is used to manage programmes. The question now is; what is a programme? In simple terms, programmes can be defined as sets of projects which will together help to deliver a given organisational objective or sets of objectives. Projects are used to introduce change in an organisation. For an organisation to be continually relevant in this dynamic world, a lot of projects need to be executed together in order to achieve stated objectives. The importance of programmes management lies in coordinating related projects which are meant to satisfy the same objective or sets of objectives. Managing Successful Programmes MSP Certification is programme management methodology that is based on set of principles and processes to manage a programme. Managing Successful Programmes MSP Certification is a ‘tried and tested’ programme management practice which is used in delivering transformational changes in an organisation. Managing Successful Programmes MSP Principles: These are the factors that form a basis for the success of any transformational change there are gotten form lesson learnt from previous programme experiences. Managing Successful Programmes MSP Governance Themes: These describe an organisation’s attitude and approach to programme management. They provide guidance on having the right mix of people in order to achieve success. 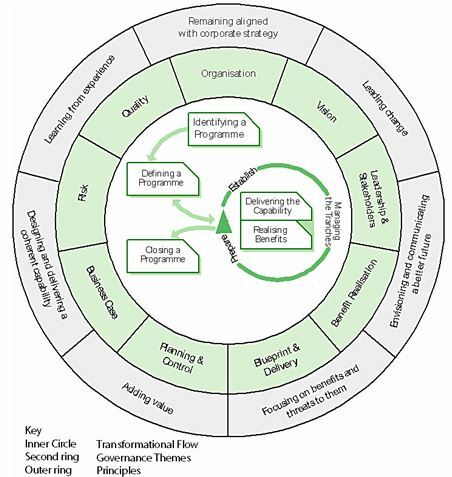 Managing Successful Programmes MSP Transformational flow: this explains out the path through the lifecycle of a programme from start to finish. Managing Successful Programmes MSP Certification helps individuals to make use of the best practices in programme management to successfully implement and execute transformational changes. This certification course (Managing Successful Programmes MSP Certification) helps individuals to carry out coordinated activities and projects which are of strategic importance to the organisation. Managing Successful Programmes MSP Certification helps to integrate solutions developed by projects into the organisation’s day-to-day activities without negatively impacting on performance and effectiveness. Managing Successful Programmes MSP Certification helps to lead business transformation taking into consideration the complexity, ambiguity and risk involved. Managing Successful Programmes MSP Certification helps to ensure that what is expected of the capacity and the ability of the organisation to change is realistic. Managing Successful Programmes MSP Certification helps organisations to bring corporate strategy in congruence with the delivery mechanism for change and the day-to-day environment. This certification course (Managing Successful Programmes MSP Certification) emphasises the importance of monitoring progress, assessment of performance and the realisation of benefits. Managing Successful Programmes MSP Certification is a generic framework which can be applied in managing programmes in varied environments. Managing Successful Programmes MSP Certification adds value to organisations by emphasising on benefits.. Managing Successful Programmes MSP Certification places importance on gathering experience and feedbacks in order to continually improve in delivering subsequent programmes. The aim of the foundation qualification is to ensure that candidates have the requisite knowledge and understanding of the Managing Successful Programmes MSP Certification guidance in order to interact within a team or act as an informed member of a programme management team. Candidates are required to pass the Managing Successful Programmes MSP Certification Foundation level exam before they can be eligible to sit the Practitioner exam. Anyone who want to know about programme management. The aim of the Practitioner qualification is to test the ability of candidates in applying the Managing Successful Programmes MSP Certification guidance to real-life situations. This is reflected in the way the Managing Successful Programmes MSP Certification Practitioner level examination as it is structured in a way to apply guidance to a given scenario. Managing Successful Programmes MSP Certification Practitioner level is a prerequisite for sitting the advanced practitioner level. Note that Practitioner and Advanced Practitioner qualification holder are required to sit an additional re-registration examination within five years of their original qualification. You can contact us for more information on this. We are specialists in project and programme management and other related certification courses. Can I take the training and exam with Certify-Cheap? Who issues the MSP certificate? There are no formal requirements for the foundation exam but, to sit the practitioner exam candidates are required to have passed the foundation exam. Likewise, candidates are required to have passed the practitioner exam before they can be qualified to sit the Advanced Practitioner exam. Where can the methodology be applied? The Managing Successful Programmes MSP Certification methodology can be applied in any environment as it employs a generic approach to programme management.